It is clear that getting the right people for the offensive coaching staff is more important to the Cowboys' brain trust than titles. The formula for how all the works minus Linehan and the titles the coaches will carry are still under discussion. Jones likes the "flexibility" of the staff. The structure will likely be the topic of conversation when Jones takes the staff and honored players out to dinner Wednesday night at the Pro Bowl in Orlando, and in the days to come. "There's a lot of great possibilities," Jones said. . "I really feel good. I don't feel in a hurry about anything." "One could include Garrett's resume control of play-calling"
"It could be more, or less," Jones said of Garrett's involvement in the offense. "Either way. But I'm comfortable with Jason Garrett." Former Cowboys quarterback Jon Kitna is already working with the coaching staff from Orlando. While the team has yet to officially announce its exact position, it has been speculated that Kitna would coach the quarterback, the position he played in the NFL for 16 years, including two full seasons with the Cowboys. However, Kellen Moore is the current QB coach although he is one of the candidates to become either offensive coordinator passing game coordinator. 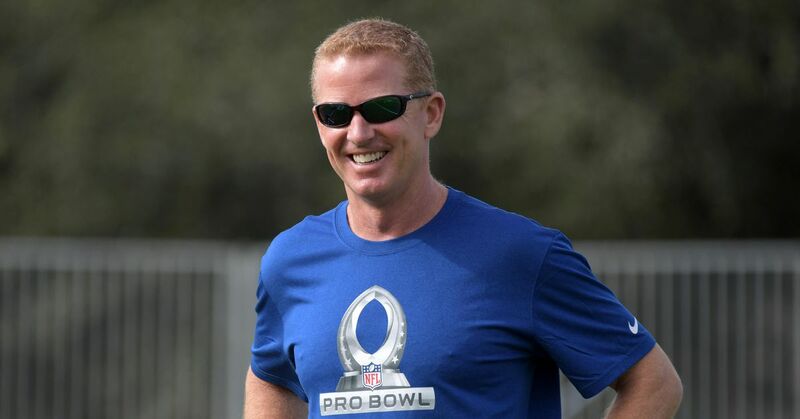 Machota offers and inside view of what's going on at the Pro Bowl practices in terms of Cowboys coaching staff. Jon Kitna, Kellen Moore and Doug Nussmeier walked together onto the NFC's Bowl practice field Wednesday morning at the ESPN Wide World of Sports Complex. Each was wearing an outfit that matched the rest of the Cowboys' staff, who was coaching the game for the third time in the last five years. So it's clear now, right? Moore will be Dallas' offensive coordinator, Kitna will take over the quarterback room and Nussmeier will coach tight ends for the second consecutive season. that they have parted with Scott Linehan, offensive coordinator and play-caller for the last five seasons. Machota : I think it has a lot to do with what they've seen on a daily basis behind the scenes since it arrived in 2015. Fans don't get to see the brilliant offensive mind that players, coaches and forms teammates talk about. They see a quiet guy on the sidelines who didn't have big time success as an NFL player, so they wonder what Dak Prescott could possibly learn from him. I've heard fans say that they need to be more animated and get in Dak's face. But that's not his style. That's Kris Richard's style. And fans love that. Because it's something they can see. Richard is not considered head coaching job because he gets animated at times. It's because he's a good coach. The Cowboys believe Kellen Moore can be a good coach, too. I think the biggest thing it would bring if OC is some unpredictability. The Cowboys' 2018 staff had Jason Garrett, Scott Linehan and Rod Marinelli in their top positions. All three have been in the NFL for a long time and all three have strong convictions. They've seen their styles work for decades. But that also means decades of trends are out there for opponents to study. With Moore, no one knows what his offensive philosophy is, so it will be much more difficult to predict what the offense will do in certain situations. But Garrett will also be willing to adapt to some of those new ideas. I believe Marinelli's willingness to allow Richard to have an influence was a positive for the Cowboys defense this season. In this look at how the duties might shake out with the offensive staff in Dallas is an interesting tidbit about Kellen Moore, whom many fans are not impressed by. Moore, who was the quarterbacks coach in 2018 after spending three seasons on the Cowboys' roster, has long been considered a future coach, and multiple sources said a couple of teams approached the Cowboys about interviewing Moore and were denied. He has a tight relationship with Prescott, who trusts him implicitly. Cole Beasley has been talking about being underutilized or overlooked in the offense. Beasley's comments quickly elicited from the Dallas front office. Ahead of the free-agent market, Dallas Cowboys receiver Cole Beasley suggested the front office dictates where passes are thrown. On Wednesday, Cowboys EVP Stephen Jones brushed aside that notion on the Rich Eisen Show. "I would have hoped that his frustration was not all the case," Jones said. "We don't get involved in that. The only thing we do is decide if we're going to pay players a lot of money. Or if we're going to trade for players and give up big picks. that they would be involved if we are going to do things like that; that there is a reason that we are going to be involved. nature. In terms of the game plan and getting involved with what our coaching does to get ready to play the ball game. And most of all people, Cole is always involved in getting balls and getting catches. He's just an integral part of what we're about. Certainly, he's made a lot of big catches and key catches in games that we've won. "Perhaps Beasley's comments will make the Jones family consider giving someone else big (ger) bucks this offseason. Getting added for the Pro Bowl just caps off what has been a great experience for Amari Cooper since being traded to the Cowboys. “It's very special In that way that you described, ”Cooper said.“ Not many people have switched teams in the middle of the season, reaching 1,000 yards or being able to make it to the Pro Bowl. It's really special. ”Cooper caught 22 Passes for 281 yards and one touchdown with the Raiders before exploding for 53 catches for 725 yards and six touchdowns after being traded to the Cowboys. The Cowboys defense started off very strong, then seemed to fade down the stretch. This might look like that might have happened, but includes a positive outlook. I might be stretching here, but as a look at the Cowboys' 2018 defense and try to make it even better next season, I would continue to fortify the defensive line with the talent to stand up to the run and keep the linebackers clean to do their jobs. I would continue acquiring players who can get to the quarterback. Further, the safety position remains a concern for me as explosives went up and takeaways went down. The Cowboys' corners will continue to need support in this scheme. And while Jeff Heath and Xavier Woods are both decent, "decent" is not good enough if you are trying to build an elite unit. In other words, I am impressed by the youth and talent on this defense, but I think you can use more talent at every single level of this group. The competition should be open to many of the starting jobs. The Senior Bowl practices are underway, and here are five names to watch when the Cowboys are on the clock in the NFL draft, including a personal (gig 'em) favorite of mine. If the Cowboys opt to continue their strategy of waiting until the later rounds to invest in a nose tackle, Texas A & M's Daylon Mack is as good as any choice. As a pass rusher, Mack is primarily a power rusher who uses his powerful lower body and deliberate hands to collapse the pocket with bull rushes (just ask Alabama center Ross Pierschbacher ).